Yes, spring can be lovely, with some cheery displays of daffodils, and magnolia trees in their glory. But it's also an all too good time of year to witness with dismay and alarm the ongoing and accelerating invasion of the Princeton area by fig buttercup. Also known as lesser celandine, it's a small spring ephemeral that seduces with its pretty flower, then takes over your yard and garden. It has already radically changed the spring landscape over in the Pettoranello Gardens and Mountain Avenue area, and I've watched it spreading from yard to yard over the past five years in my neighborhood near Hamilton Ave and Harrison Street. These photos are from Maple Street just down from Nassau Street, where a still localized infestation is radiating out from one of the yards. A yard will have one or two plants the first year, dozens the next, quickly multiplying to hundreds and thousands. It's pretty easy to see whose yard was first by the density and extent of the invasion. Across the street, the fig buttercup is taking over the lawn and flower beds. The next door neighbor has an invasion in its earlier stages. Why be concerned? There are many degrees and styles of invasiveness. I'll compare fig buttercup with other aggressive plants below, but here are the essentials: Fig buttercup is an introduced species that has escaped any limiting factors that may have been present where it evolved. It's poisonous, so nothing eats it. The seeds and the abundant underground tubers allow it to spread rapidly. It can grow in the sun or shade, garden or nature preserve. Some gardeners may feel relief that, like other spring ephemerals, it will fade back into the ground after a couple months. But that seems small consolation as it increasingly displaces other plants that might otherwise grow. By comparison, myrtle is a groundcover that people plant and may later regret as it takes over flower beds. But it doesn't spread down the street to ultimately pave the local watershed. It merely vexes the gardener who planted it. By the same token, wisteria vine poses a much smaller threat than porcelainberry. Though an abandoned wisteria vine can spread over an acre or more, weakening trees and suppressing all other growth, it doesn't spread by seed, so remains localized. Porcelainberry is a vine that not only smothers all other vegetation, including trees, but also spreads to new locales by seed. Most pesky weeds of the lawn--wild garlic, dandelion, false strawberry, ground ivy, etc--have not become problems in nature preserves because they are either edible to wildlife or intolerant of shade. That's what makes invasives like fig buttercup and stiltgrass stand out as major threats. They spread rapidly, tolerate shade and a variety of soils, and nothing eats them. Since fig buttercup dominates in spring, and stiltgrass dominates in summer and fall, they represent a one-two punch that dominates the landscape visually, and leaves little chance for other herbaceous species to prosper. Since both are not eaten, yards and preserves become increasingly inedible for wildlife. Fig buttercup can be confused with winter aconite, which also blooms early with a similar flower, but the leaves are much different. Though nonnative, I've never seen winter aconite spread beyond the limits of a yard. This photo shows the native marsh marigold in the foreground, with leaves much larger than fig buttercup's, which is in the background. (For a closeup comparison of the two species, click on this link.) The marsh marigold, by the way, is very rare. I've seen it only a couple times in the wild. I planted the one in the photo, over at Pettoranello Gardens, purchased from Pinelands Nursery many years ago. Click here for past posts about fig buttercup (lesser celandine), including a letter I wrote to the Town Topics two years ago that struck a nerve. What to do? If there are just a few plants, you can dig them up and put them in the trash (not the compost), being careful not to leave any small underground tubers behind. But though I've had organic sympathies all my life, and don't like to use herbicides, the easiest way is to use a squirt of 2% glyphosate on the leaves (Roundup is the most common brand, but more generic forms are available), or else some herbicide more specific to broadleaf plants. We take medicines, and when used responsibly in a targeted manner, herbicide can play a similar role in nature. Environmentalism has been too caught up in good vs. bad, when the biggest threat to nature and ultimately ourselves, whether it be carbon dioxide or a pretty little flower, is too much of a good thing. A pair of mallards visited our backyard this morning. The male stood in the middle of the lawn while the female strolled down the garden path, presumably in search of a nice pond to call their own. Were they checking out nesting options? If so, I can't imagine they were pleased. The only standing water is the fillable-spillable tub that catches water from the downspout. The most appealing interpretation of their surprise visit is that one of them might have been born here five years ago, back when by chance we had ended up with a pair of mallards among our fine feathered pets in the backyard. Being a male and female, they soon had five ducklings to call their own. As the ducklings grew, the yard seemed to shrink, overfilled as it now was with ducks and chickens. There were times when we'd hear the nasal call of geese flying overhead, or one or another duck would fly in an impressive arc around the boundaries of the yard, and I'd think for sure they would respond to the call of the wild and venture off into the big world beyond our fenceline. But they never did. The mallard family eventually ended up at a farm outside of town, whose owners were kind enough to take them off our hands. I read that mallards live 5-10 years in the wild. How lovely to think that they might have come back to have a look around at their old haunts. For some posts about the ducks we had behind our house on busy Harrison Street, type the word "mallard" into the search box for this blog, or follow this link. Visiting the towpath for the first time in a long time last week, I found a fresh layer of crushed stone being laid down. May this renovation live long and prosper, for we found out back in August of 2011 what massive storms can do to a wonderful facility like the towpath. That devastation lingered for many months, for lack of any funds to repair the damage. Now, apparently, there's been an infusion of funding, at least for the towpath and hopefully for the NJ parks department itself. Most people go to the towpath to get some exercise and fresh air next to the water. I go to check on a little nature trail loop we created just upstream of the Harrison Street bridge. 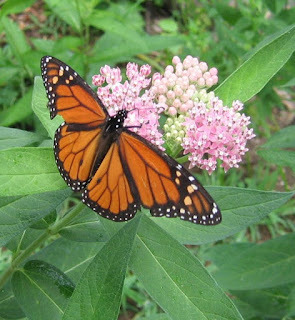 The first post on this blog, back in 2006, documents that first year's "harvest" of wildflowers after the state parks department reduced the amount of mowing it was doing in the meadow between the towpath and Carnegie Lake. Thirteen years later, I'm still serving as steward of that meadow, marking elderberry shrubs so that the parks crew will avoid them during the annual early spring mowing of the meadow. Otherwise, the elderberries would have to resprout from their roots each year and never get a chance to bloom. Along with the native wildflowers that bloom there in mid-summer, there are remnants of non-native ornamentals, like this row of forsythia, left over from when the towpath was planted by the university to ornament the entryway into campus. Spring is also a good time to inventory what else needs to be done when the parks crew comes to mow. Maintenance, seldom given its due, makes all the difference, whether it be a trail, a meadow or a planet. the images of coral reefs whose brilliant diversity has succumbed to overheating, with algae draping itself over the skeletal remains. and coloring an ephemeral stream down the slope from the Veblen House. Is this a new algae, accidentally introduced and proving invasive? Or is there something about the unusually wet weather New Jersey has been having? If this stuff covers over vernal pools, the frogs and salamanders will surely be in trouble. It would be nice to think that this is merely a temporary aberration that will clear up and not return any time soon. A nutrient imbalance, perhaps. 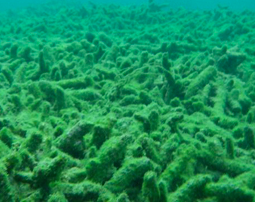 One source describes how phosphorous can be released from the bottom of a pond if the water runs out of oxygen. As scientists are wont to say, more research is needed, and please leave a comment or send an email if you've been similarly surprised this spring by similar smotherings. This past week, some in Princeton may have detected a feint scent of smoke in the air. As reported in Planet Princeton, the smoke came not from a distant burning house but from the intentional use of fire in habitats at Fort Dix, a half hour south. So-called "prescribed burns" are used to reduce fuel loads in fields and forests, making them less prone to intense, destructive wildfires. Equally beneficial is the impact of these intentional fires (I like to call them "mildfires") on the health of habitats. Many species, particularly in the coastal plain south of Princeton, are adapted to periodic fire that would have occurred in the past, particularly in pre-colonial times when American Indians used fire to manage the landscape. The lack of fire, like the lack of keystone predators, contributes to the unnatural state of our seemingly "natural" areas, and underscores the need for management to better restore healthy ecological functioning in our open spaces. For some, the idea of intentionally lighting fires runs contrary to environmental goals, since fire releases pollutants and more CO2 into the air, leaves ash on the ground that could be washed into streams during the next rain, and violates the still prevalent notion that we should just stand back and let nature do its thing. On the other hand, periodically burning off accumulated fuels reduces the chance of a much larger conflagration, and the ash can stimulate vigorous new growth that will absorb more CO2 from the air. The NJ State Forest Service posted information on its prescribed burning, including news of a law passed last year to better promote prescribed burning in NJ. "Last summer Governor Phil Murphy signed into law “The Prescribed Burn Act,” which preserved landowners’ rights to prescribed burns, strengthened protections for practitioners, and expanded acceptable uses of prescribed fire from reducing traditional hazard fuels to recognizing the benefits of habitat management as well as other forestry and ecological needs." 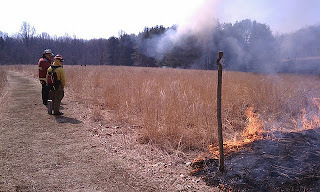 Back when I lived in Ann Arbor, MI, I helped conduct prescribed burns in prairie habitats in and outside of town. There'd be a fire break around the prairie--usually a 10' wide strip of mowed grass--to reduce the chance of the fire spreading from the intended area. In late winter, a prairie is full of the dead remains of last year's growth. (If you read up on fire ecology, you find out that many species of trees and grasses adapted to fire have evolved to leave behind combustible material that lingers in the landscape to expedite the next fire that comes along. 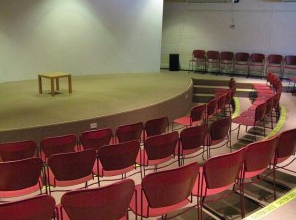 Think of those decay-resistant pine needles, oak leaves, and tall stems of prairie grasses. By contrast, European grasses brought to America tend not to leave much combustible material when they die back in the fall.) We'd begin by having a couple people with drip torches start a strip of fire along the edge of the downwind side. Several of us with garden rakes and broad rubber "flappers" would snuff out any flames headed in the wrong direction. Then, when the fire along the downwind edge of the prairie was going well, the upwind side of the field would be lit on fire. The two fires would burn towards the center of the field. There'd be a dramatic converging of the two fires before they burned themselves out for lack of any more dried grass to burn. It was exciting, efficient, even elegant in the way a field could be cleared of fuel and rendered ready for the new growing season. The layer of ash on the ground looked like the fur of a bison. Freed by the fire from the smothering mulch of last year's growth, new shoots would sprout from the perennial roots, their fresh green a pretty sight against the black of the ash. The photo above was taken at Schiff Nature Preserve, 30 miles north of Princeton, where they burn their fields and oak woodlands periodically to improve habitat. 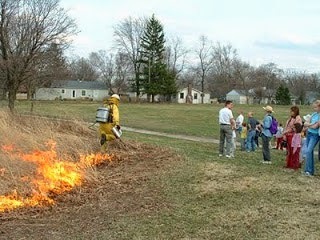 The state park service does prescribed burns at various places along the DR Canal, though not in Princeton. It's important to emphasize that prescribed burns require some basic safety precautions, and are only done by professionals after considerable planning. Are there any habitats in Princeton that could benefit from prescribed burns? One interesting possibility is several detention basins in Princeton's parks that we've converted to native prairie grasses. These acre-sized plantings are surrounded by turf that would serve well as a firebreak. Similar plantings in a park in Ann Arbor are burned each spring. Families are invited to come to witness the event. First, kids collect seed from the "wet meadows", then everyone steps back to watch last year's stems get consumed by flame. After the fire burns out, the kids scatter the seeds in the ash. Some even bring a picnic lunch to enjoy as part of the event. In the photo, you can see a residential neighborhood in the distance, which is not at all threatened by this elegant horticultural method for managing the lovely grasses and wildflowers that comprise these miniature prairies. Composting Options: How to Build a "Wishing (the Earth) Well"
This post provides instructions for building a kind of home composter I designed. Called a "Wishing (the Earth) Well," it has a number of nice features, including being reasonably attractive while keeping animals from digging through your food scraps. Follow a few basics, and composting food scraps will be easy, odorless, and satisfying. Most any container on the kitchen counter will do, but we use a stainless steel bucket with lid. Every few days, there's a trip to the composter in the yard. Nature does the rest. With the suspension of the curbside collection of organics (food scraps and whatever other compostables would fit in the small rollcarts), about 800 Princeton residents who had discovered the satisfaction of keeping food scraps out of the trash are now wondering what to do. One option for those with a yard is to compost at home. There are lots of composters out there. Those that you can rotate in order to mix the contents seem like a good idea, but I don't know anyone who has gotten them to work well. I've found that the ones that have direct connection to the ground are the most likely to succeed. Moisture, fungi, earthworms, and other decomposers all migrate upward to work their wonders on the composting material. If you want to keep wild animals out of the compost (some areas of Princeton have rats), here's a design that keeps the food scraps contained in durable metal screening (hardware cloth), while using leaves to keep the foodscraps insulated from temperature extremes and hidden from view. It's called a Wishing (the Earth) Well because it looks like a wishing well but works in reverse, giving nutrients back to the earth rather than pulling water out. No turning or periodic remixing of contents is necessary. When it's empty, it looks like this, with a circle 3 feet in diameter of green fencing, and a central cylinder of hardware cloth that holds the food scraps. When packed with leaves around the outside, it looks like this. The leaves insulate and obscure the inner cylinder of foodscraps. More often, it looks like this, as the composting leaves and food settle. To get started, you'll need a roll of wire fencing, 3 feet high. See bottom of post for material details and purchase options. Measure out 10 feet of the 3 foot high fencing. I use a long board to keep the roll of fencing stretched flat. Cut the stubs flush at each end so you don't have wire tips sticking out. Make a circle of the 10 foot length of fencing, overlap the ends a square or two, and use plastic zip ties to tie the ends together. Four should be sufficient. The corral portion is done. Now for the inner cylinder where the food scraps go. You can see in the background some chicken wire, which is cheaper but not very strong, and not fine enough mesh to keep rodents out. In the foreground is a cylinder cut from a roll of hardware cloth three feet high and 3.5 feet long. I recommend cutting the ends flush so you don't have a bunch of the little metal stubs sticking out. The cylinder should work out to be about a foot in diameter. If you have a particular top in mind, make the cylinder small enough in diameter that the lid will fit well and stay on top. Anything flat or bowl-shaped and sufficiently heavy to deter animals will be sufficient. I've used a piece of leftover bluestone, or an old metal bowl with a hole drilled in the bottom so it doesn't collect water, and weighted down with a brick. For the bottom of the cylinder, cut a square of hardware cloth slightly larger than the circle and bend the corners down. Use a few plastic zip ties to keep it on. It will be pressing against the ground, so just a few zip ties should be sufficient. All that's needed beyond this are 4-foot long stakes--one for the inner cylinder to keep it upright, and a minimum of two for the outer ring. A hubcap can be put on top, looking surprisingly classy, like a symbol of the sun. It can serve as the top if you don't have animals trying to get in, or can perch atop any other, heavier top you use. Wire fencing, plastic coated or galvanized, runs $30-40 for 50 feet. The 3 foot high hardware cloth is also available in rolls. The best prices for fencing and hardware cloth require buying more than you need. It's best, though, to have more than one Wishing (the Earth) Well, to provide more capacity in case the food scraps fill up the inner cylinder in the winter when not much composting and settling is going on. You can also prepare one for harvesting by letting its contents rot down into compost while adding the latest organics to the other composter. Though the leaf portion of the corral was topped off many times with additional leaves, all has decomposed down to what looks like 6 inches of leaves at the bottom. This outer crust of leaves disguises the rich compost underneath that is ready for use. The left tub shows the leaf mold; the right is decomposed kitchen scraps. The fall harvest of compost is ready to spread on the garden beds. Here you can see that the rodents were not able to get into the foodscraps. Annual emptying is necessary so that tree roots don't have time to invade. It's so convenient to have leaf corrals discretely integrated into the landscaping here and there, so that leaves don't have to be hauled or blown long distances. In a house, we have discrete containers for trash in nearly every room. Why not have similar convenience in the yard? One novel way to insure that all the leaves in the leaf corral are moist enough to decompose is to use one of those root feeder rods to poke holes in the pile so the rain can seep in. Better yet, connect a hose to the root feeder and use it to inject some water into the pile. Leaf corrals can be easily hidden in a backyard corner, but if integrated into the front yard landscaping, they show neighbors and the community that leaves should be treated as a gift to our yards, and not something to be hauled away. One thing to keep in mind is that animals such as raccoons may climb up the fencing to try to get to the inner column of food scraps. Though they don't succeed, they bend the wire fencing. More stakes would help, but stiff, springy wire woven around the top of the fencing is working well thus far. (Note: the wire I'm using is some leftover electric deer fencing wire a friend gave me.) Our composter in the front yard doesn't have this problem. As mentioned above, make sure the leaves are moist enough to decompose. Tree roots will invade from the bottom if the leaf corral is never emptied, which is fine, but if you want to use the compost elsewhere, remove the fencing some day in the fall, rake away the layer of leaves and shovel out the rich inner core of compost created over the summer. Put the fencing back in place and the corral is ready for a new fall harvest of leaves. The outer ring of leaves will keep reducing in size. This is good--it shows that the leaves are decomposing--but it also means the inner column of foodwaste will become exposed if one doesn't keep adding leaves or garden clippings to the outer ring. A white plastic pumpkin found on the curb during a dogwalk served as substitute for the hubcap. The melon plant sprouted from the central cylinder of food scraps, which gets surrounded and hidden by leaves later in the fall, and was able to produce a small melon during those days when summer spends its last heat. On of the signs on the leaf corral says "Add a leaf and make a wish." I treasure the times I've happened to glance out the window and seen someone stop, read the sign, pick up a nearby leaf and drop it in, then walk off with a new sense of satisfaction. Maybe their wish was personal, or global, or maybe they just simply wished the earth well. We have taken so much from the earth. This leaf corral is a quiet way of saying it can feel really good to start giving back, in small and very large and steady ways.